There’s a lot of cuisine, Americanized and traditional, that I enormously miss: Mexican, Korean, Thai, Chinese, and (of course) Indian. But Peru’s cuisine is truly some of the best in the world, and maybe as a result, the chefs in Lima love putting their own fingerprints on other culture’s foods. When you’ve got the food shakes for a certain thing and you just want that thing, dang it, Lima can be an infuriating place to be. 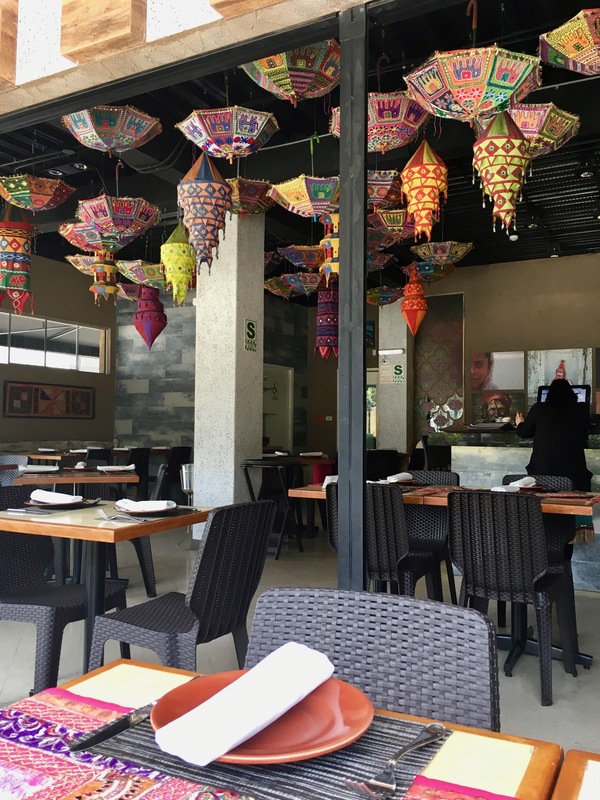 Most of the bad reviews on restaurants serving ethnic foods in Lima are about lack of authenticity. 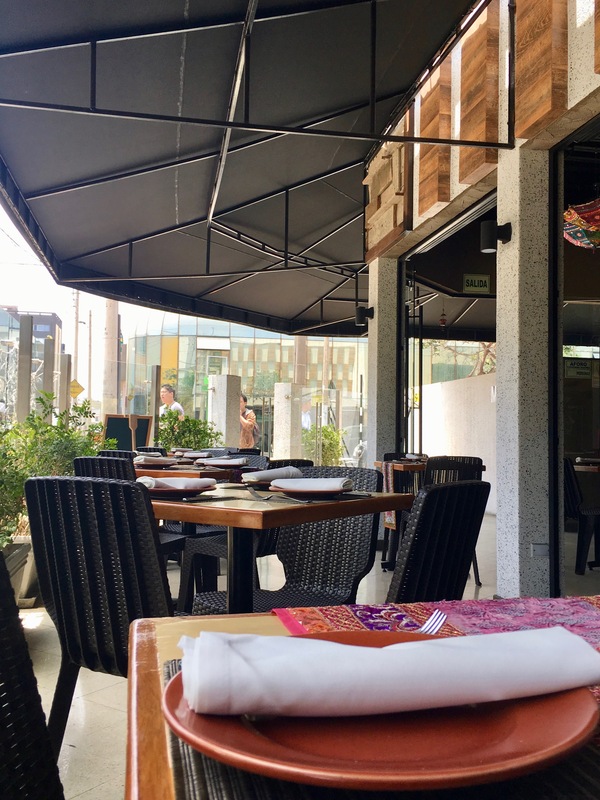 Basically, “I’ve had the real version of this food, and this isn’t that.” And in all fairness, sometimes Lima restaurants do fail to make it totally clear that what you’re about to have will be food from Country X… but with a Peruvian twist. For expats or just well-traveled eaters looking for their fix, that’s understandably frustrating. 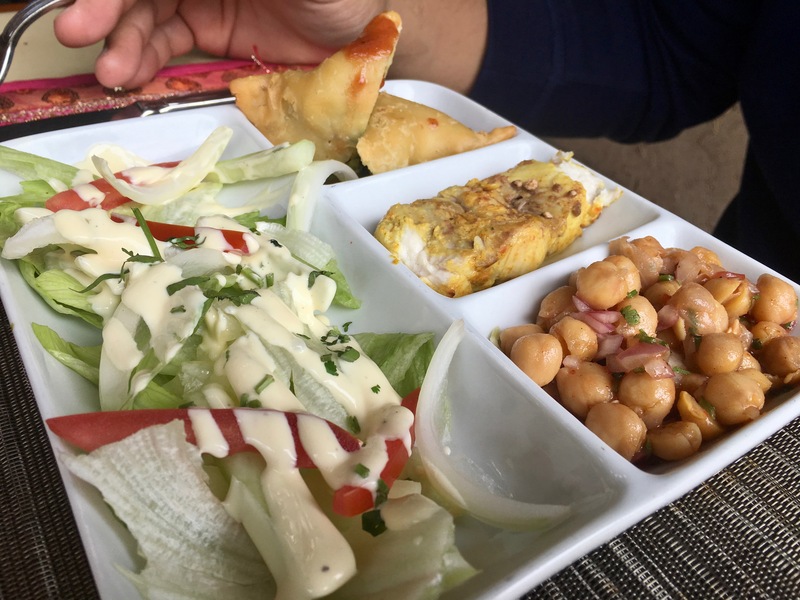 However, if you’ll only eat a certain thing when it’s exactly the way you’ve had it before, you’re going to miss out on some amazing food experiences in Lima. Massala is located on Av. Bolognesi 201 in Miraflores: It’s on a corner, and it’s basically facing an EDO Sushi (which is bright yellow and hence a lot easier to spot). 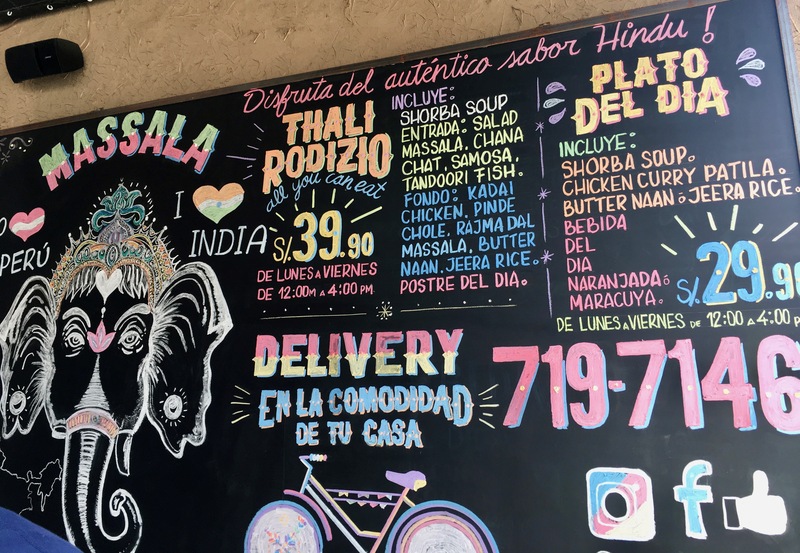 Massala serves Indian… with a Peruvian twist. I can’t recommend coming here if you need your curry fix. I can, however, recommend coming if you want a nice lunch date or a general food adventure. The interior is nice and open, with a sort of ground level patio. The design is cheerful and clean, and the place feels like a new, modern building. “But what about the food!” Ok, so, I tried to order Aloo Matar, which is my go-to, hands-down favorite curry. It’s a vegetarian curry with potatoes and peas. Yeah, yeah, I know, I’m wild at parties. But Massala didn’t have Aloo Matar. That’s pretty weird, from my understanding: I’ve ordered curry from holes-in-the-wall to white linen restaurants in several different countries. They’ve always had Aloo Matar. It’s just a standard vegetarian dish. Well, after the waiter gave me a weird look and I panicked, I picked the cauliflower curry, which was the first vegetarian option that I saw. Then I waited for him to ask what spice level I wanted, you know, from 1 to 5, from 1 to 10? I like my curry about spicy enough to peel paint, so this is an important step of the curry-ordering process for me. Yet no spice levels were mentioned. The waiter took the other orders and went back to the kitchen. 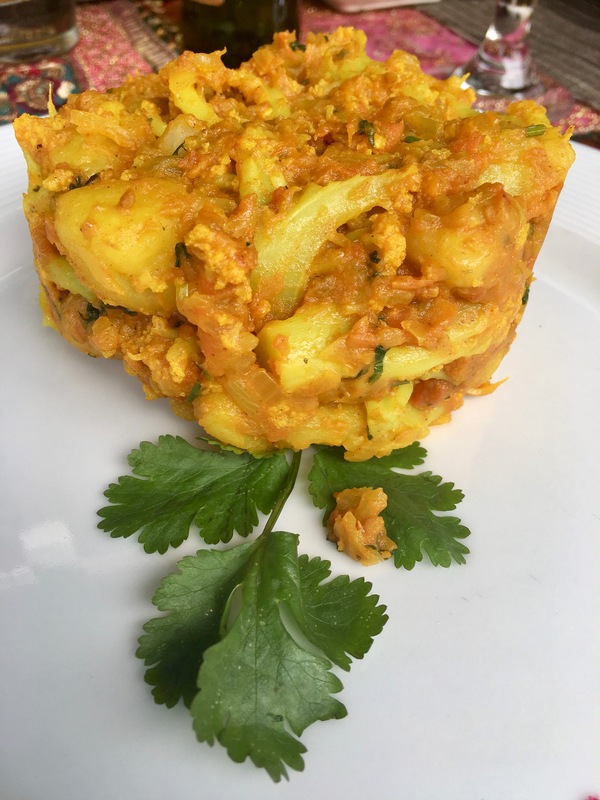 And what emerged about 20 minutes later is what you see below: Cauliflower “curry”, molded into the shape of a causa, no rice, but served alongside two baskets of thin naan. So here’s my verdict: Was it curry? Eh, no, not by any traditional standard. And my husband’s order, which was described as some kind of “all-you-can-eat” platter, both underestimated Ivo (my hombre could all-you-can-eat you outta business) and failed to grasp curry culture… which forgoes the all-you-can-out option by simply serving more than you can eat every time. But was it good? Oh wow, yes, it was totally a delicious meal. Could have been spicier, for my standards, but the balance of flavors was really well done and clever. It was truly a unique and inspired Peruvian take on curry: As in, this is what curry would be like if a super gifted Peruvian chef made it. If you’re desperately hankering for a huge round of real curry, and if you’re simultaneously in Lima, go to Mantra. 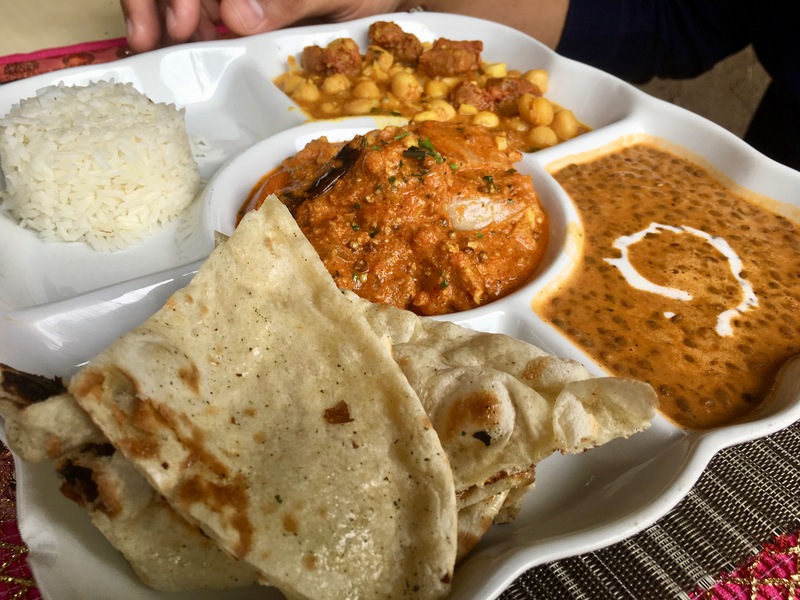 But if you’re open to new food experiences, go give Massala a chance. Their interpretation of this cuisine is very worthy of your taste buds and your time.